We’d love to help you with your next event! 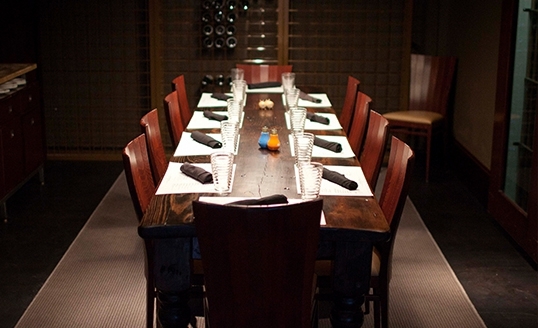 We offer a variety of private dining options at Local Three or are happy to cater an event at a venue of your choice in Buckhead or anywhere in Atlanta. We’re able to accommodate groups of any size in settings ranging from casual to more formal as required. If you’re interested in hosting an event or having us cater for you, click the button below & our events department will be in touch soon. Local Three’s signature Wine Room, the KOR is located off the main dining room, behind sliding custom-made barn doors that allow for complete or partial privacy. Named for the infamous Mobile Mardi Gras Krewe, the table in the KOR is made from an old KOR Mardi Gras float. • A minimum to book this room may apply. Our largest dining space is adjacent to our lobby with a private entrance. The Bushwood offers complete privacy and comprehensive audio and visual services for meetings or entertainment. • This space is well suited for private rehearsal dinners, pharmaceutical dinner meetings, cocktail receptions, wine dinners, working lunches and professional seminars. Our Garden Terrace Patio is a partially covered space located at the front of the Forum building with access to the Borghese gardens. Weather permitting, this is an incredible space for any al fresco event. Planning your wedding in Atlanta? Our Garden Terrace Patio is perfect for rehearsal dinners and receptions! Do you have another venue in mind or want to host a special dinner in your home? We can bring food and drink to you! Our catering team will create a memorable event produced to your specifications. Our chefs are practiced at creating and delivering exceptional culinary experiences tailored to your guests. Email us at events@localthree.com for more information about off-site events and catering, or click the button below. Our Sunday Brunch Buffet was named one of the best in Atlanta by the AJC, and now you can host your own private brunch with us in our main dining room with a buy-out – any day of the week! You can choose our popular buffet or an À la carte menu. Perfect for wedding and baby showers, family gatherings, or birthday and graduation parties. Our “party girls” will help plan your next unforgettable event!